We know that game development can be quite complex – and it starts with all the different terms we use to describe it! That’s why we’ve collected and defined the words that we come across on a daily basis – for you to get a better idea of what we are talking about all the time! Agile: A quality of an organization and its people to be adaptive, responsive, continually learning, and evolving. Action Script: Programming language used by game developers to create titles that run on the Flash Player platform. Backend: In client–server applications such as online games, where part of the program runs on the PC client and part on the server, the backend constitutes the program that runs on the server. Backend Department: Team responsible for interfaces and tools used for the games, such as backend systems for player administration, landing pages, the payment shop, and more. Bug: Not the animal, but can be equally annoying: an error, flaw, failure, or fault in a computer program or system. Casual Game: A game that is easily accessible, intuitive, and offers a quick, entertaining diversion to a broad audience. Client: Computing program that is run on the user’s device (the program that is used to play the game). The client is also the device itself, for example a PC. Client Development: In charge of putting the individual items of the game together, e.g. embedding graphics. Continuous enhancement of the design functionality of the games and other web projects. Code Jam: Programming marathon often hosted by game developers with the aim to develop solutions or innovations for software products in a given time. Usually involves support from local pizza delivery. Concept Art: First involvement of the art team… Prototyping and determining the style through quick sketches and complex illustrations for all types of game assets. Core Game: Typically used to describe games developed for a core gaming audience with a lot of gaming experience and dedication to this hobby. Core Game Loop: The core of the gameplay, i.e. a series of fun actions that the user undertakes repeatedly to play the game. Cross-Platform: The game is programmed in a way that enables users to use the same account on a variety of devices such as smartphone and PC. Could also mean that players can play with other players across platforms, e.g. an Xbox player with a PC player. Downtime: Period during which the game is unavailable due to maintenance. Event: Temporary occasion in a game, for example the recurring wheel of fortune in Goodgame Empire, where players can win items for the game. Feature: Permanent component of the game which is defined in the development stages of a project, for example the interactive world map in Legends of Honor, which players can explore freely. First Game Session: Period from the first start of the game to leaving the game for the first time. Often involve tutorials that explain the gameplay to the players and get them excited about the game. Fix: Change to the game intended to permanently solve a problem, e.g. cure a bug. Hotfix: Particularly fast update to fix a mistake in the program. Flash: Platform that hosts games programmed with ActionScript, making them playable without a plugin. Mostly used for browser and Facebook games. Free-to-play game: Title that can be played completely free of charge. Front End: In client–server applications, the frontend constitutes the program that runs on the client, for example the PC. Front End Department: See “Client Development”. Gameplay: The game mechanics, i.e. a pattern or rules and actions that create a gaming experience. Game Balancing: In charge of the mathematical side of game design. Analysis and optimization of the games to offer users lasting entertainment, create a flow for both paying and non-paying players, and ensure that the games retain the right balance, especially regarding the in-game economy. Game Design: Conception and logical implementation of the content and mechanics of new game features and new titles. Game Engine: A special software framework for computer games that runs the gameplay and is in charge of its visualization. Game Server: Hosts programs and data for MMO games and responds to requests from clients. Global Launch: A game is launched in all relevant markets and users are invited to play the game. Kanban: A lean approach to organizing knowledge work. By sticking to four principles (1. Visualize your work, 2. Limit your work in progress, 3. Focus on flow, 4. Continuous improvement), the goal is to remove waste and therefore become more efficient and effective. KPI: A “Key Performance Indicator” is a figure which shows developers, product managers, etc. if the game they are working on is performing as intended. Player retention, that is players staying with the game for a certain amount of time, is one of those indicators. Live Bug Analysis: Takes care of reported bugs by reproducing them in order to prepare detailed bug reports so that the developers can fix everything fast and without losing time. Localization: Complete adaptation of a game to a specific market. 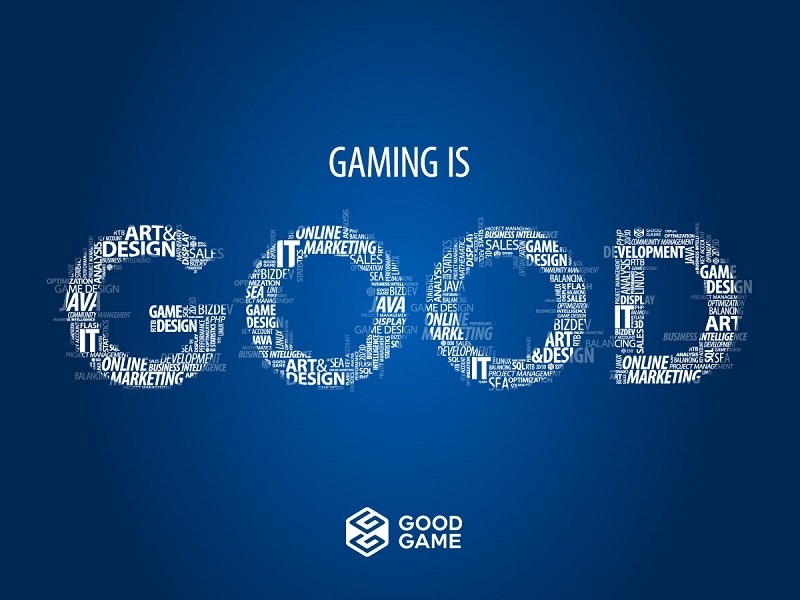 At Goodgame, all games and features are translated in up to 26 different languages to make them accessible for players worldwide and then tests the text in the games. The team also translated this blog post, of course. Thank you! Multi-Platform: Game is programmed for multiple operating systems such as iOS, Android, Windows, MacOS, and Linux. MMO Game: Massively multiplayer online game that hosts a large number of players within the same world, where they can cooperate and compete with each other. Plugin: A software component that is added to an existing program to make things work. Pre-Client: Also known as pre-live. A game server that receives updates before other servers, allowing problems to be analyzed in a closed environment without global implications and under live conditions. Pre-Production: Period during which the game principles are refined, e.g. setting, core game loops, design. Product Manager / Producer: Coordinates all game production teams and decides upon the overall direction that a game will take, e.g. game design, gameplay, etc. In charge of optimizing the user experience and maximizing the business value of the product. Project Manager: In charge of task, time, and team management during game development. Prototype: Proof-of-concept game that can be played to evaluate if it will go into production. PVE: Player versus environment modewhere users play against the computer instead of against one another. PVP : Player versus player modethat enables battles between two or more players. Quality Assurance (QA): Testing games and systems to ensure that they keep improving. RPG: Role-playing game where players take on the role of a character and develop it over time. Scrum: Scrum is a simple framework for effective team collaboration on complex software projects. By continuously inspecting and adapting, the risks are kept low and decisions can be made on real-world results instead of speculations. The product is kept in a potentially shippable state at all times. Simulation Game: Game that simulates aspects of reality, such as farm building in Goodgame Big Farm. Soft Launch: Title is released in a few selected markets in order to test and improve its performance in specific areas. Sprint: Iterations in Scrum are called Sprints, which are periods of one month or less during which a usable, and potentially releasable, product increment is created. Stage Gate Process: Structured process to support new game projects at Goodgame Studios during all phases of development. It fosters the fail fast principle and increases the chances of success for new games. Strategy Game: Game that requires strategic and tactical skills and where either the computer acts as an adversary or players can play against one another. Technical Launch: Game is launched within a small selected market to test its technical functionality. Unity: Game engine used to develop games for PC, mobile, browser, and consoles. Unreal Engine: Game engine originally used to develop first-person shooters, but also implemented for other genres such as MMOs. User Experience: Experience and perception of a player who interacts with a game. User Interface: The space where interactions between humans and machines occur, e.g. between the client and the player – the screen of a smartphone, for example. Vector Art: Creation of graphics based on vectors that lead through control points, which allow images to be easily scaled without any decrease in quality.